VBS students focus binoculars on a bird! 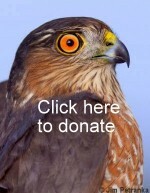 Southern Appalachian Raptor Research will offer the Big Bald Mountain Vacation Bird School (VBS) July 6 – 10, 2015. All rising 5th-7th graders who love birds, wildlife and fun outdoors are encouraged to join VBS! This is the fifth season that students will explore the Big Bald Mountain habitat to learn the birds of the southern Appalachians. VBS is a`bird-brained’ science day-camp that provides a bird’s-eye view into the ecology of breeding birds. We spend loads of time outside on the mountain hiking, searching, measuring and exploring natural bird habitats. Our daily expeditions will investigate the science and natural history of bird communities using field guides, bird apps, training games, binoculars and participation in citizen-science bird banding and monitoring projects. Click here for 2015 VBS registration materials. Partial Scholarships are available and space is limited. Please contact us with your questions and see you on the mountain at VBS 2015!